A FINE+ FRENCH & INDIAN/REVOLUTIONARY WAR PERIOD ENGLISH FLINTLOCK “MUSKET BORE” TAKEDOWN OFFICER’S FUSIL/CARBINE, BY H. HADLEY, ca. 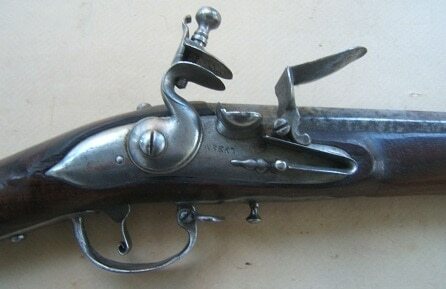 1750: In overall fine+, untouched original flintlock condition. Octagonal-to-round, 35 1/2″, flared muzzle, smoothbore, key-fastened, .75 caliber (Musket Bore), iron barrel with flat breech-top, a finely sculpted wedding-band trasition (of Spanish-Style) and a hooked-type breech. The lock of classic English design having a thread-engraved, flat lockplate with a stepped tail, its original matching gooseneck hammer, matching frizzen and a bridled gold-washed powder-pan. The touch-hole with a matching gold-liner. Sharply engraved with a “H. 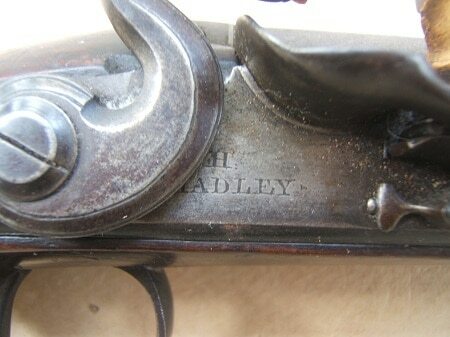 HADLEY” maker’s signature: Henry Hadley of London, UK (wrk. 1734- ca. 1774)– Contracted with the Board of Ordnance, in 1756 and was also noted for his “Spanish-type Barrel” Pistols; with examples in the Royal Collections of Windsor Castle & Tower of London (please see H. L. Blackmore’s: “Gunmakers of London”, pg. 106). Retains fine+ contours with crisp mechanics with its original components. Molded, finely carved and graceful, walnut fullstock with a deeply fluted comb, a flared muzzle-end (minor chip on right side) and simple raised points, behind the lockplate and sideplate mortises. Of mid Georgian Period takedown design with a two-piece forestock having iron spacers, at the partition; and the barrel with its original key fastings and hooked breech—-for ease in removal/takedown. Fine quality plain steel mounts of English martial form. The rifle-type sideplate of “Lord Loudon” design with its two original sidebolts and rear wood-screw. The trigger-guard with a flared forward finial and a fluted bow. Three barrel-form ramrod-pipes and a long stepped buttplate-tang with a pointed finial. Original brass tip wooden ramrod with its iron jag. 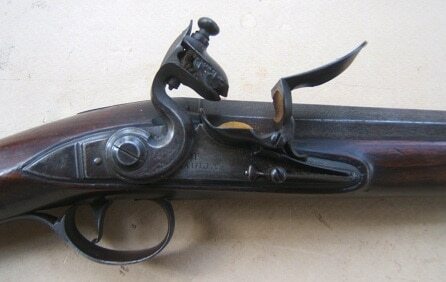 In overall fine+ untouched original flintlock condition. The barrel with an untouched gunmetal-toned age patina, some light patches of discoloration/minor staining and generally smooth surfaces. A fine quality, “Musket-bore”, swamped, iron barrel with its original silver “spider web” fore-sight, a flared muzzle and early type key fastenings. Fine lock in functional order with smooth, untouched surfaces, a strong mainspring, and a nicely engraved makers signature. The stock with only some scattered light handling marks, minor abrasions and a very fine dark grain pattern: retains 95%+ finish. 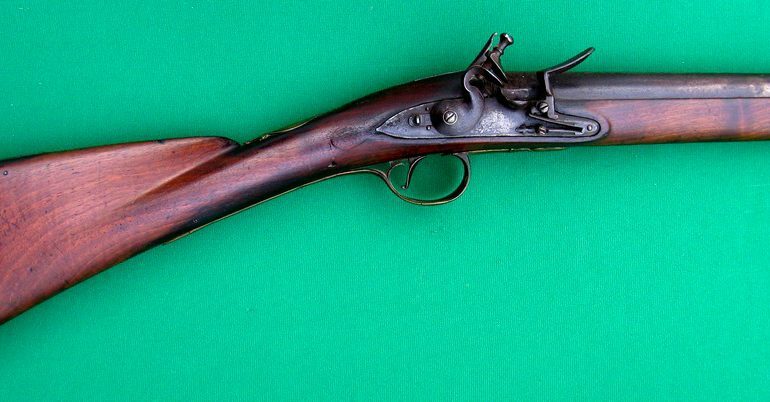 A very nice example of a French & Indian/Revolutionary War Period English Flintlock Officer’s “Takedown” Fusil/Carbine, ca. 1750. Overall length, 50 1/4″. For a similar example, please see G. C. Neumann’s: “Battle Weapons…”.